Salmon, stags, grouse, whisky, tweed, politics, wild food, conservation… The Scottish Sporting Gazette is a celebration of all that makes Scotland such a revered destination for sportsmen and women the world over. The tradition, the people, the beauty, the adrenaline – these things have long been at the core of this publication. But now it is time to take things to the next level – the diversity of content, the photography, stories that have not been told before. With more pages, thicker paper and a book-like nature, the new-look Scottish Sporting Gazette will more than earn its place on the coffee table of all those with a sense of sporting adventure. 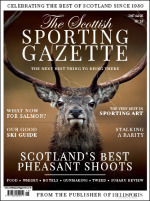 Warners Group Publications provide and support the payment platform for Scottish Sporting Gazette.